Vietnam is a country with a unique and diverse cuisine. However, there are some dishes that you may find yourself not brave enough to try them. In this post, we will share you the list of ten most awkward dishes of Vietnam, which cause a strong impression for any tourists. 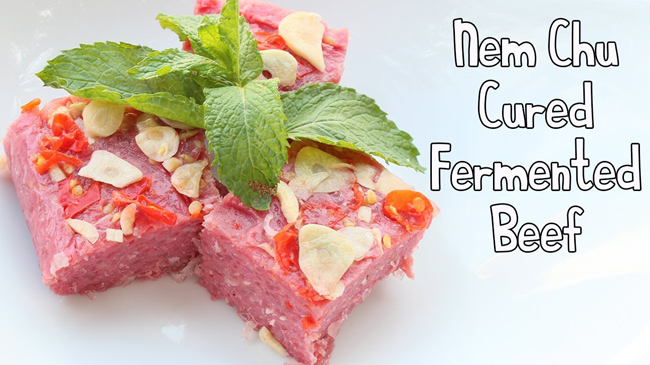 Tiet Canh (or blood pudding) is a fresh dish, of which main material is the blood of an animal. In order to prevent the premature coagulation, the blood will be mixed with fish sauce or diluted salt water. After that, the chopped innards of animal or meat will be added to the dish to enhance the blood coagulation. When trying the dish, the dinner will add some roasted peanuts and chopped herb as lemon, mints, etc. There are two popular kinds of Vietnamese blood pudding – the pig blood pudding and duck blood pudding. Besides, this dish can be made of other animal’s blood such as goose, goat, snake or even crab, lobster, etc. 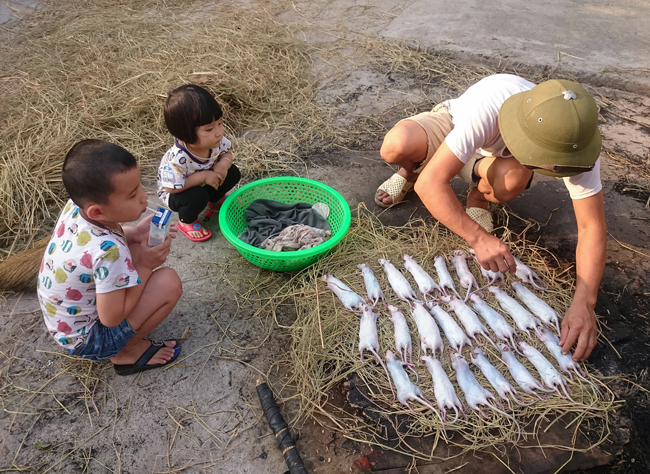 That kind of preparing food is very popular in Vietnamese cuisine, from the North to the South region. And this dish is hardly seen in any other places in the world. Due to the weirdness of preparing process and the scary look of the dish, the blood pudding is certainly listed in top most scary dishes all over the world. Nem Chua is a favorite dish of many people, thanks to its special taste. This dish is made of the fresh pork, with “thính” (a kind of Vietnamese spice made of rice), garlic, and chili. After being fermented in 3 days, nem chua is ready to serve. 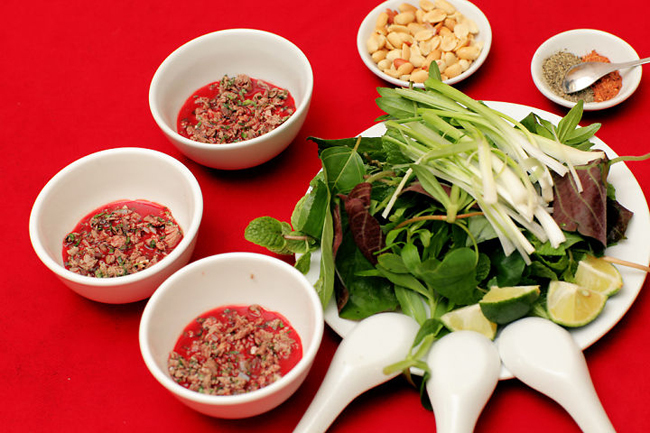 Nowadays, at some areas of Ha Noi, nem chua is also a dish to eat when drinking. To make the dish suitable for drinking, nem chua is grilled and fried. This dish is extremely attractive due to its unique taste and smell. On passing by, you may not have a look at the sign of the food stall, you may not observe other people eating, but you can smell the dish from a long distance. Some South-east Asia nations have the similar dish as Nem Chua (the same taste and smell). In Laos, this dish is called Som mou, while in Thailand, it is called naem (nham). Balut is used to call a developing duck embryo. This dish is quite common in Southeast Asia countries. The balut will be boiled and served with some kinds of vegetables. In Vietnam, boiled balut is a popular dish, which is mainly sold by the street vendors or served in common food stalls. Each region of this country has its own unique way of enjoying the balut. In Ha Noi, the egg is peeled and put into a small bowl. Then, the dinners use a small spoon to enjoy the dish. On the other hand, in the southern region, after being boiled, the balut will be put in a small cup. The bigger head of the balut will be put on the top, then the dinners will use a spoon to enjoy the dish. This dish is usually served with Vietnamese mint leaves, salt, and lemon juice. Balut can be served with beer or wine and this combination is also a favorite one of the local in the southern region of Vietnam. While in Da Nang, the spices used to serve the balut are a little bit different. A kind of sour and sweet sauce made of papaya as well as other spicy and hot spices such as Vietnamese mint leaves, chili, ginger are served with the balut in order to reduce the smell of the dish. 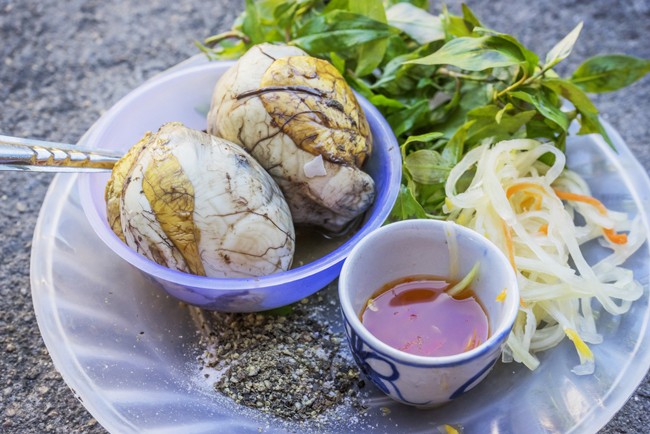 In Phan Thiet, in addition to common spices, balut is also served with Vietnamese carrot and daikon pickles. The method of enjoying is the same as in the southern and the northern region. The foreigners may find this dish quite weird and refuse to try it. The reason for this may be the full development of the duck embryo. This dish may be so terrified that it usually appears in the show Fear Factor. The peanut worms will make many people terrified by its scary appearance. However, the dish from peanut worms is irresistible. The peanut worms look like other worms, however, they are much bigger and their innards are mainly sand. They usually live in deep underground caves. 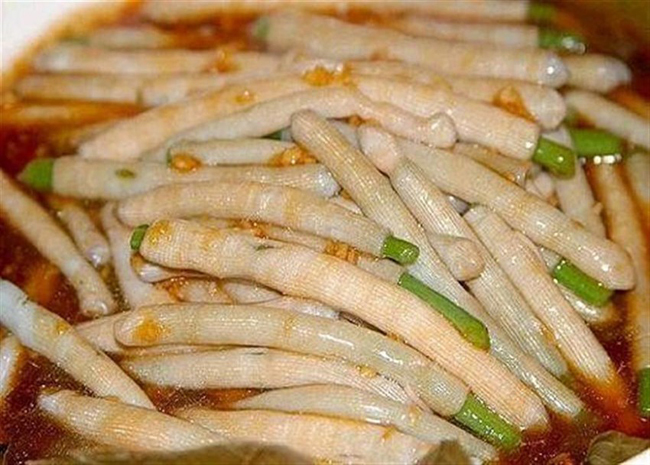 In Vietnam, those worms can be used for foods. They are grilled and served with salt, chili and lemon juice or they can be marinated with salt and chili before being grilled. Many restaurants use this dish as a nosh and it is sometimes served with beer as well. The peanut worms are crunchy, soft but quite tough and have a special taste. 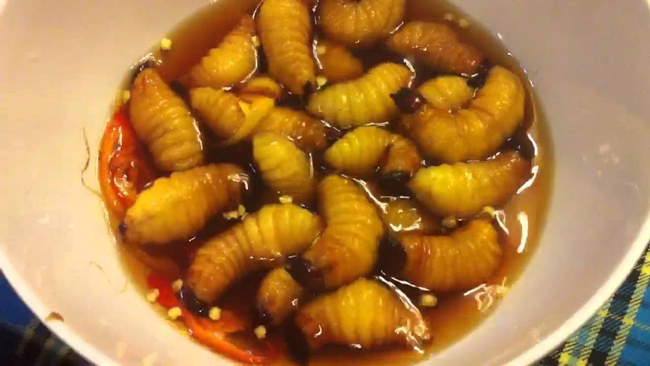 In the southern region of Vietnam, the coconut beetle larvae are eaten alive with fish sauce. Sometimes, they are also dried, grilled, boiled or used to cooked with steamed glutinous rice. Those coconut beetle larvae usually live in the coconut stem, thus, they are quite clean and have many nutritious proteins. The larva is as big as the thumb of an adult and its length is about 3 to 5 centimeters. You may find yourself terrified by the appearance of the coconut beetle larvae. 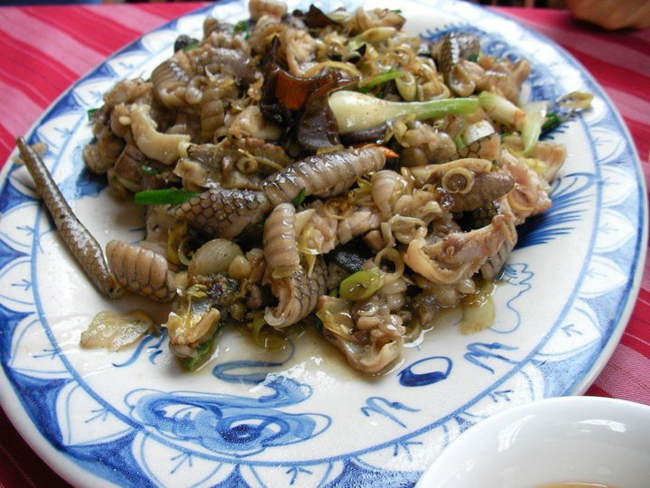 However, the dishes from coconut beetle larvae are so common that you can find them in a luxurious restaurant or a street food stall in both Ho Chi Minh City and Ha Noi. 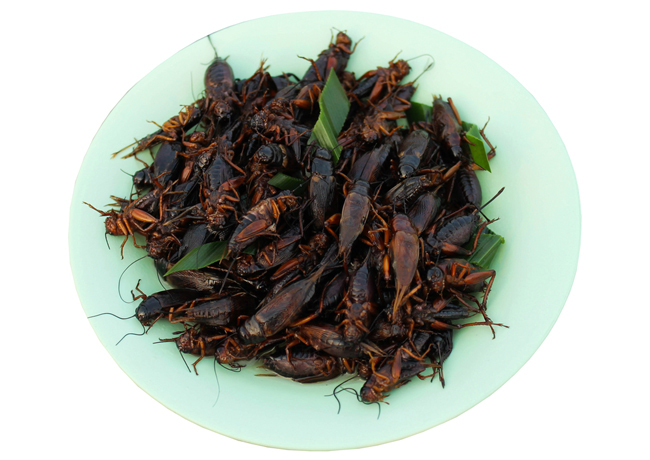 The fried white cricket is a favorite dish of the Vietnamese. This dish is usually served with beer or wine. The taste of the cricket is as delicious as the shrimps and crabs. Moreover, the white crickets are also believed to have the ability to cure the ache, obesity, and Rheumatism. The white cricket’s legs are white and they are much more delicious than other species of crickets. This dish is also served with lemon leaves and chopped pork. The orchid tree salad is a unique dish of the Northwestern region cuisine, especially the Thai people. In the season of the orchid tree, the women always bring some orchid trees when returning home after a hard working day. Many dishes include the orchid tree as a main material such as steamed orchid tree with sticky rice, the orchid tree with bamboo sprout soup, or orchid tree salad. The flowers will be washed, boiled in the hot water and crushed to complete the processing. The orchid salad is a dish of harmonious flavor – the sour, spicy, salty, bitter, and sweet taste. On spring days, if you get bored with greasy dishes, then the orchid salad will be a great replacement for your diet. The mouse can be used for food in Vietnam cuisine. 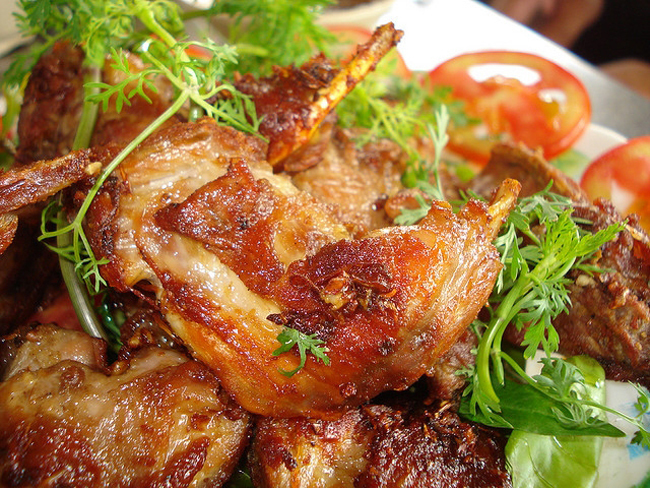 In some regions of the northern Vietnam, the dishes from the mouse are indispensable specialties on many important occasions. Moreover, the mouse dish is also a luxurious dish in some regions. It may cost you more than 100 000 VND (about 5 USD) for per plate. There are more than 30 dishes that include the mouse as the main material such as grilled mouse, steamed mouse with lemon leaves, stir-fried mouse with garlic and onions, fried mouse with salt, etc. Fermented Shrimp paste is made of shrimp and salt. The fermenting process resorts to a special enzyme of the shrimp to create the special flavor. The fermented shrimp paste is an indispensable sauce in many Vietnamese dishes such as Bun dau mam tom (Fermented shrimp paste with fried tofu and rice vermicelli). The foreigners usually find this dish quite awkward and some cannot stand its smell. However, if you try the dish for two or three times, you will fall in love with it. Being a tropical country, Vietnam has a wide range of reptiles, especially the snakes. However, the snakes used for foods in Vietnam are only the Chinese cobra, Banded krait, and Chinese ratsnake. However, the image of the chief using the knife to kill the snake may be quite scary. Furthermore, the blood smell of the snake and the taste of wine is an unpleasant combination. Those are still big hindrances for the foreigners when trying this dish.